Get ready for the information explosion! It’s taken a full ten days to process all of the information that we learned about Dai Gyakuten Saiban, but Diana Gray, resident fangirl, is back and ready to break it down for you. No, Michael, you turn that music off, I didn’t mean like that. In case you haven’t been checking Court Records constantly or even following me on Twitter (apology to all my followers for that information overload—I was low-key fangirling), fans have received a literal flood of DGS information this month, with more on the way. I’m going to cover the highlights here for you today. I’m keeping this first bit as objective as possible (aka let’s be honest, it’ll be subjective), and I’ll share my full thoughts at the end. On March 31, we learned that Dai Gyakuten Saiban will be released in Japan on July 9th. There will be both a standard release and a special limited edition version. We’ll be getting to that in a bit. On April 1st, Dai Gyakuten Saiban was featured on Capcom TV. There was a gameplay demo of the first case, the one that takes place in Japan. Ryuunosuke is suspected of a murder that occurred at a restaurant and is defending himself. We didn’t see a lot (the developers specifically stopped after the presentation of the first piece of evidence), but what I took away was the stunning attention to detail (facial expressions in particular) and that Payne’s ancestor looks awesome. This is shaping up to be incredible, but you knew that already. They also discussed the escape-room game in Japan that I talked about last time. Let’s be honest, this thing deserves its own bullet point. Capcom’s April Fools’ Day joke to us, Dog Gyakuten Saiban. Unfortunately, everything about it has been taken down—there was a video. But I still have this lovely visual for you. Isn’t it cute? Fingers crossed for localization! Alright, but back to serious news. Also on April 1st, there was a Nintendo Direct. Nothing in the English Direct about DGS, but in the Japanese Direct, there was a new trailer. It’s kind of awesome. Alright, let me sum up what we know. 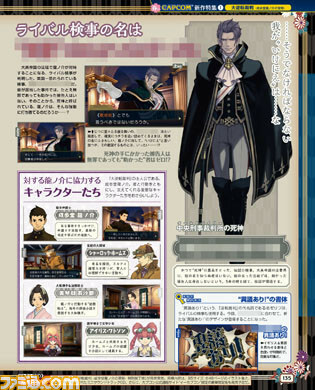 First of all, that gorgeous man you see above is the new prosecutor, Baroque/Barock (no full translation yet). He’s a legendary English prosecutor who has never allowed a defendant to escape. He’s returning to the courtroom after a five-year leave and apparently, his nickname is “The Death God of the Old Bailey”. Apparently, it took forever to come up with the name Baroque/Barock. Dai Gyakuten Saiban will be bringing back some kind of weird combination of the jury system introduced in the last case of Apollo Justice and the multiple witnesses gimmick from Professor Layton vs. Phoenix Wright: Ace Attorney. All one has to do is convince a MAJORITY of the jury members that the defendant is not guilty to win the case. Each jury member has different ideas about the facts, so it’s going to be about finding the contradictions in their opinions to procure the verdict. Takumi had originally envisioned a game with multiple endings, but he eventually settled on this. Additionally, Ryuunosuke will be able to walk around the courtroom during the trial, and the closing argument is the essential bit that you’ll use to sway the jury. Multiple witnesses are back, and you’ll be able to use the “HANG ON!” action from Professor Layton vs. Phoenix Wright: Ace Attorney to question them further. As I noted earlier, this game is really focusing on detail—camerawork, space, and facials of characters, particularly eye movement. The first case will be called “The Adventure of the Grand Departure”. Two witnesses were revealed: a waiter and an elegantly-dressed woman. Some DLC featuring our main characters was also announced. Released between 7/9 and 7/19, it’ll be called the “Randst Magazine Special Edition”. No further details on that, but it’s most likely a reference to Strand Magazine, where Sherlock Holmes was originally published. Finally, the game’s limited edition will contain an art book and a CD with tracks from the game. Let’s move on to talk about that limited edition, shall we? What you see above is the full limited edition pack for Dai Gyakuten Saiban. I would kill for this. No, Diana, keep it objective! 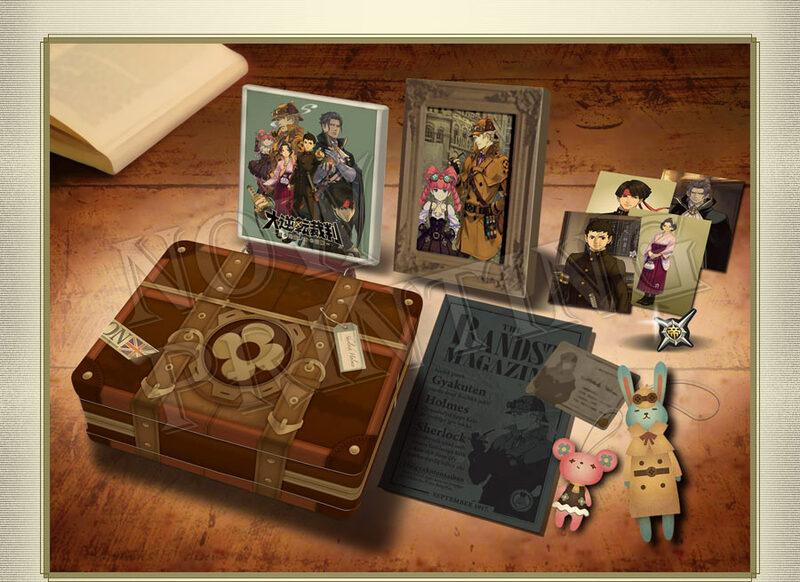 It includes Holmes’ trunk, two rabbit plushies of Holmes and Watson, six postcards, a picture frame, a Randst notebook, Holmes’ business card, and a student badge for the Imperial Yuumei University (implying that a school is involved somehow). Capcom’s schedule for NicoNico was announced for April 25th and 26th, so that’ll be my next project. Alright, I’m going to try and keep it brief, but here’s some initial thoughts that I have. Although a release date announcement is encouraging, I’m having flashbacks to Dual Destinies. If I recall correctly, the game was released in Japan in July, and not in North America until October. Granted, this is a pretty quick turnaround time, but for a game that promised the released would be close, I’m a bit concerned. My prediction is a release date may be announced at NicoNico. Also, I’m hoping that maybe it’ll be like Dual Destinies in the respect that there’ll be a playable demo at Anime Expo. We all remember how that went. The gameplay demo looked good; really all I have to say. Again, the attention to detail bodes well for this game. I can’t wait. That Famitsu article was ridiculous. I had to read over a couple different summaries to make sure I got everything, but Court Records was extremely thorough. The new prosecutor is extremely attractive, and NOT JUST BECAUSE HE LOOKS LIKE MILES EDGEWORTH. Although he does. A lot. He’s giving me a bit of a Manfred von Karma vibe, which I’m okay with. I’m pretty excited to see how this jury system plays out. I feel like this is going to revolutionize the Ace Attorney legal system, maybe even bring it a little closer to the actual legal system of England, Japan, or America. I also was a big fan of the multiple witnesses gimmick, so having that return is a major plus in my book. Case name—are they breaking the “turnabout” theme? I honestly don’t believe that, it just hasn’t been fully localized yet. Then again, this is before our hero Phoenix Wright masters the turnabout, so maybe the theme will be something else. But “great”? Doesn’t really do it for me. Still wondering if things like the DLC or the limited edition stuff will be released over here. Predictions: limited edition stuff, definitely no—but hey, a fangirl can dream, right? DLC, it’s a bit premature to make a judgement, given that we don’t know what it’ll actually entail, but I’m going to put a hesitant no on this one as well. It’s not super common knowledge that Dual Destinies had some DLC that was not localized and since I’m drawing so many parallels (read: one) between DGS and Dual Destinies, I can foresee this DLC being Japan-only. That’s all I’ve got for you right now. Sorry for being so late, but I’m sure you see why this took me so long to process. We’re getting closer, guys! Soon we’ll have a new, probably very different, Ace Attorney game in our hands! And I for one couldn’t be more excited. Fangirl out! I’m just wondering who let them bring swords into the courtroom. They had no choice, Cody Hackins refused to testify unless he was allowed to bring his sword. He was obviously inspired by the stubborn nature of these attorneys. Ah yes, the time Edgeworth lost an argument to a grade schooler. Classic. The same person who allows whips in the courtroom is my guess. I mean, are YOU gonna be the one who tells the man toting the deadly weapon that he’s not allowed to have it? Type! For the love of all that is holy, type!